In June 2012, we went to Austria. After we made two brief sightseeing trips there from Czech Republic in 2009 and from Slovenia in 2010, we finally decided to spend a two-week stay there. We did not regret it: this country abounds with many treasures in various fields: landscapes, cities, villages, history, architecture, culture, gastronomy... As a result, we went back there in August 2014 during a combined trip with Slovenia. Climate variations from one region to another, sometimes leading to substantial temperature variations from one day to the next, or even in a single day, made those journeys exhausting at times, but fortunately it did not spoil the fun. Finally, the only fly in the ointment is the excessively high price of some parking lots, some tolls (which are required even if you have the highway sticker), and access to some remarkable sites. The capital, Vienna, is a sumptuous, refined and trendy imperial city. 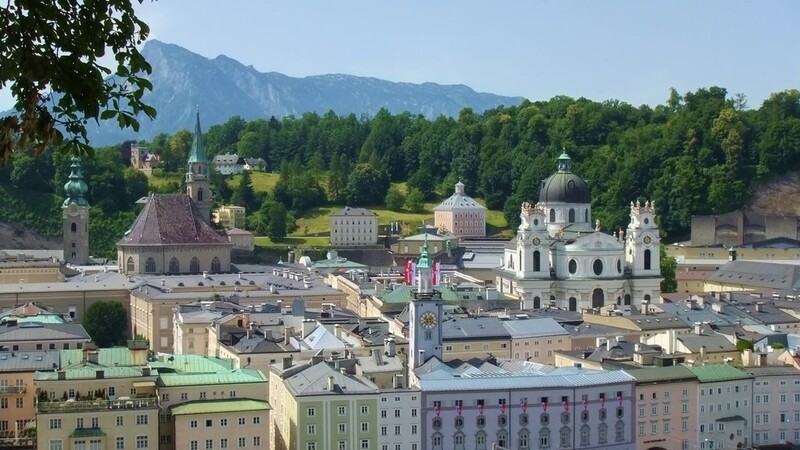 With Salzburg and Innsbruck, it reflects the glorious past of the country, worthy legacy of the Habsburg. Proud of its past, Austria remains nevertheless open-minded and avant-gardist. Traditionalism and modernism meet easily as in Graz or in Linz. Very popular with tourists in any season and ideally located in the heart of Europe, it never stops surprising us, with its contrasts and its diversity. Mainly made up of mountains, the Alps are naturally the most picturesque, with a special mention to Tyrol and Innsbruck, which is from now on part of our favorite cities with Prague and Ljubljana. We also took advantage of the opportunity to spend a night in Ljubljana, returning to Slovenia felicitously two years after. We also made sightseeing trips to other border countries: Hungary, Italy, Liechtenstein, Switzerland, Germany, Czech Republic (3 years after!) and Slovakia. The heart of Europe... permanently. Imperial city crossed by the Danube which is full of Gothic, Baroque and Neo-classical buildings, it is part of the great European capitals. Honestly, we think Prague is more beautiful: indeed, the Czech capital enjoys an extended city centre which is not spoilt by modern buildings that upset the harmony. There we can only find authentic and colorful buildings, steeped in history. According to the centre of Vienna, it is even more extended but the refined architecture of historic sites is sometimes interspersed with more modern buildings which became dated. The fact remains that it is a beautiful city which left us with a very good memory. Historical monuments are numerous: the inevitable Opera, a reference, but also the Town Hall, the Burgstheater, the Parliament, the Fine Arts Museum... Needless to say that several days are necessary to visit the city. Feel free to wander in the Burggarten and its famous Mozart statue, as well as in the pedestrian streets. Make a stop at the Dominicans Church and its splendid frescoes, and then at the amazing Stephansdom Cathedral, a clever mixture of styles. Its striped and colored roof on its own is worth seeing. You can reach the top for a handful of Euros and a high staircase to climb. The view of Stephansplatz and the rooftops of Vienna is stunning! If you are courageous enough, move away from the city centre to admire the Majolica House in the 6th District, which is one of a kind. It flourishes in a remarkable blaze of colors and many highly refined architectural details, as much the facade with its ceramics tiles as the wrought iron curved balconies and the stairwells with its sumptuous banisters. In the 4th district, you can contemplate the Art Nouveau style Secession Building and its golden dome depicting laurel leaves entangled to form a ball. Very nearby, the Church Sankt Karl Borromäus Karlskirche, baroque church, the most majestic in Vienna, displays its two amazing cabled towers. It dominates the Karlplatz, which superb metro entrance is on its own a real Art Nouveau architecture treasure, with very polished up curves and outlines. 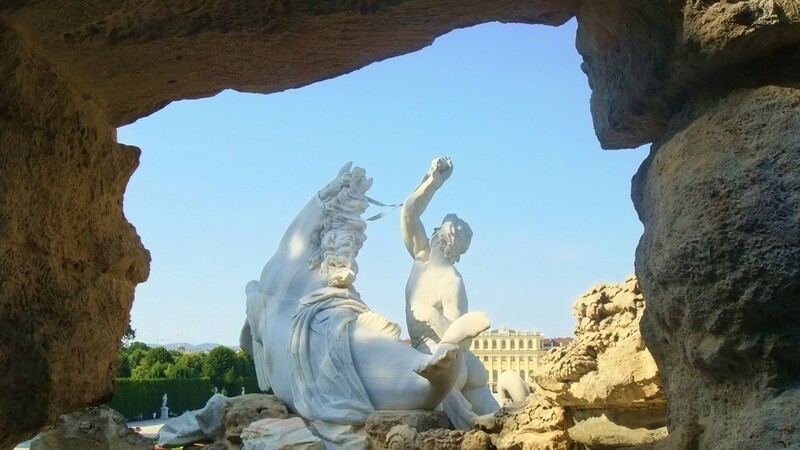 Belvederegarten is located in a wide French garden dotted with fountains and statues showing admirable originality and diversity. It’s made up of two edifices with a noticeable architectural richness, particularly the upper Belvedere, very baroque and filled with decorations and finishes. With its two floors, it overlooks the town and offers an unrestricted view of the gardens. However, the lower Belvedere is worth seeing as well and appeals to you with its frescoes on the ceilings and its trompe-l’oeil paintings. It has many rooms, each one with its style and its personality. It also includes an orange grove. The whole complex has an artworks collection which is the more plentiful and diversified as it stretches from the medieval age to the contemporary age. Finally, it would be a pity not to take half a day to visit Schönbrunn, the « Viennese Versailles ». The site is far from the centre and you have to get there by car or even better: use transportation. The simplest is the subway (U-Bahn). The architectural complex is very dense and very varied; the French garden is much extended. However, if you want to visit the Palace, you must pay EUR 10.50. If you go to Vienna by car, be aware that the traffic moves freely on the whole. On the other hand, parking is not free and it is sometimes limited in time in the city centre from the 1st to the 9th District. Personally, we preferred to park our rental vehicle in another district away from our hotel (to be specific, the 20th District) and make the effort to walk rather than paying a substantial amount. Between Vienna and Graz, we made a stop in Rust, in the Burgenland region, located at the furthermost bounds of Hungary. Unknown to tourists, it enjoys yet the sunniest climate of the country. Small town full of charm, Rust is located on Lake Neusiedl (Neusiedler See) which is a tremendous asset. It is also surrounded by hills and vineyards. Its center is remarkably well preserved, and beautiful old houses surround the superb central square. Many storks' nests adorn the roofs; the presence of these birds livens the place up. The Seehotel is sumptuous and enjoys a privileged lakeside location. Restaurants have very pleasant courtyards. Finally, it is possible to buy products from local farms. Crossed by the Mur River, Graz, 2nd city of Austria and capital of Styria, can boast a past of imperial residence. Don't be discouraged by its industrial and sordid outskirts, because the center is on its own a masterpiece of architecture, as much cultural and historical buildings (including Opera) as simple homes. Graz is young and dynamic, thanks to its four universities. Nightlife and outdoor life are hectic. Very open to other cultures and other traditions, it has furthermore an innovative and original spirit – witness the amazing Island on the Mur River (Insel in der Mur) - built owing to the naming of the town as European Capital of Culture. It is a shell-shaped islet with a daring modern architecture linked up to the banks of the river with two bridges. It includes a bar that we recommend you at least for the completely staggering interior decoration, and an amphitheater. Fortress Schossberg, formerly hoisted on a promontory overlooking the town, was destroyed and converted into a park. We lingered there with enchantment. The view over the rooftops of Graz is stunning. Stairs are beautiful but very steep. Then the funicular is an ideal alternative for those who don't feel able to climb them. The impressive Bell Tower (Glockenturm), as well as the amazing Clock Tower (Uhrturm) with its reverse hands, is part of the few remains of the fortress. A staircase will lead you to the Herberstein gardens, very exotic and ideally exposed to the Sun. Like Vienna, it is quite difficult to park there if you do not want to pay a substantial amount (for example, the parking lot of our hotel yet distant from the city centre would have cost us a whopping EUR 12.50 for the night). Therefore, we parked our car for free in the parking lot of the large City Park shopping mall located approximately 2 kilometers away. However, be aware that it has opening and closing times. So check it before you leave your vehicle. Mariazell, small Styrian town located at the furthermost bounds of Lower Austria, is famous for its pilgrimage. The natural setting is idyllic, dotted with verdant and full of life trees in the middle of a hilly area close to the mountains. The center is colourful and picturesque. The main attraction is obviously the beautiful and astounding 17th century basilica, as much for its historical interest as for its high architectural value. Its very typical market will enchant you and appeal to you. As we were back from Slovenia, we made a one-day stopover in Klagenfurt, capital and cultural centre of Carinthia. Located in the South of the country, it has the advantage of being on the Wörthersee lakeshore, and its incredibly mild temperature (around 22 degrees), which makes it a very popular destination for vacationers. However, be aware that access to the lake is not free. It is a dynamic city where it is good to live. The historic centre boasts remarkable buildings with varied pastel colors. Italian-influenced architecture flourishes in many courtyards and beautiful squares linked by cobbled alleys. 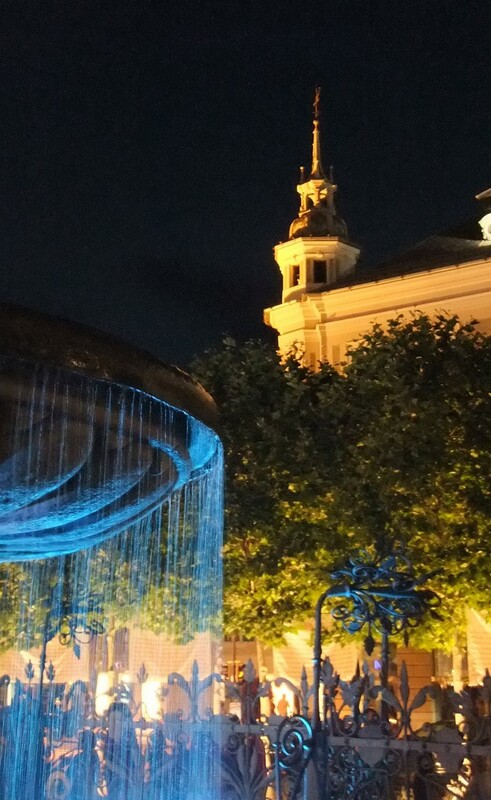 The main squares are Alter Platz, in a pedestrian area filled with sumptuous private mansions, and Neuer Platz and its outstanding fountain topped by the Lindwurm dragon, symbol of the city. 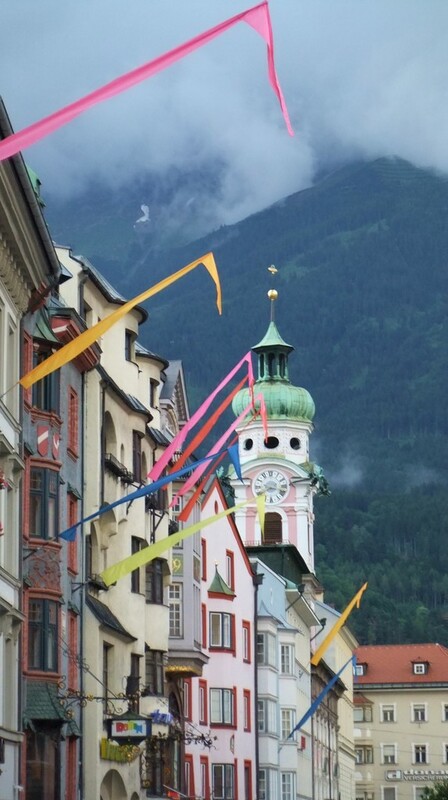 We made a two days stopover in Innsbruck, capital of Tyrol. This young and dynamic university town with a very pleasant atmosphere immediately appealed to us. The quality of life is undeniable, which makes it a very popular destination summer and winter alike. Cafés and restaurants in the pedestrian heart of town are high quality. The richness of its heritage and its architecture is remarkable. With medieval, baroque and classical style, its diversity is very significant, highlighted by beautiful facades with extremely varied colors. The town is surrounded by Alpine peaks more than 2500 meters above sea level, so you can see mountains in the background wherever you are. The Inn River which crosses it adds to its attraction. We stayed at the hotel Weisses Kreuz, steeped in history, filled with an old-fashioned charm with its furniture and decoration of past centuries, and particularly warm. Remarkable buildings are numerous, but if we had to select two of them, we would pick the gothic Hofburg Imperial Castle, with lavish interior decoration, and then the Goldenes Dachl (the Golden roof) emblem of the city and first Habsburgs' residence. It owes its name to its gilded copper tiles roof. However, its beautiful façade is worth seeing as well. For all these reasons, Innsbruck is part of our favorite cities with Prague and Ljubljana, and we plan to return there someday. Innsbruck is part of our favorite cities. To have direct access to the rubric, click here. In the rest of Northern Tyrol, we also were attracted to Rattenberg, village built around its castle which was used as a fortress, of which only remain today ruins that are however a genuine attraction. Many shows take place there in summer. Smallest town of the region, it preserved successfully its authenticity and its medieval charm. It is famous for its glassware handicrafts, its colorful facades and its ironworks. Alpbach, typical Tyrolean village, enjoys an exceptional environment. With meadows and picturesque mountains, the panorama is breathtaking. Beautiful chalets, some of which are rather impressive, proudly display their balconies with armfuls of fresh and colorful flowers. It is completely preserved, which allows it to keep its character. There you feel so cut off from the rest of the world that you find it hard to imagine it could become urbanized one day, which is fully cheering. The air is pure and invigorating. It is the ideal place to practice hiking in an idyllic setting. Located in a region of lakes and mountains, Kitzbühel is a family town that offers various sporting activities summer and winter alike. But it is above all a world-famous ski resort. Unfortunately, we had not really the opportunity to visit it, because of the terrible weather mentioned in the rubric "Our anecdotes". However, during a brief lull, we realized with amazement that the same tradition as in Slovenian villages' cemeteries subsisted in small Austrian mountain villages as well: the inhabitants come to honor their dead's memory by placing candles and lanterns on the graves. Furthermore, the cemetery there is built around the Church, which also gives it some charm. Lienz in Eastern Tyrol is a lively and warm mountain town with Roman origins. Its archaeological site is there to testify. Its centre is not extensive but dynamic and colorful. The architecture is simple but pleasing to the eye, and its churches and convents are worth visiting. Sports city, its specialty is cross-country skiing, discipline for which it enjoys a national reputation. The inevitable Grossglockner straddles two regions: its western slope is in Eastern Tyrol, and its eastern slope is in SalzburgerLand. Located in the heart of the Hohe Tauern national park, this is the peak of Austrian Alps (3798 m). The road that leads there is picturesque: wheat fields, rivers, waterfalls, meadows, before you reach the exceptional viewpoint which faces summits displaying their everlasting snows, that you get the impression to be able to touch with your fingertips. Marmots, not very wild at all, like to make a spectacle of themselves. On the other hand, the toll is excessively high: EUR 32 per vehicle! Expect also to suffer a significant fall of temperature between the start of the road and the arrival to the point of view, for there is a 1500 meters difference in high. Salzburg, 4th city of Austria, has many architectural, cultural and musical treasures. Its beautifully preserved centre is a UNESCO world heritage site. The city of Mozart (there is the home of the famous musician's birth) can boast an exceptional heritage. Remarkable sites are countless. Its superb set high up fortress seems to watch over the rest of the middle class city, that flourishes in sumptuous palaces, churches, Baroque buildings, last but not least the cathedral. Perfectly clean, you really enjoy strolling in its streets day and night, when lights bring out beautiful facades. Getreidegasse, the most famous street in the city, is a real attraction on its own. It is very lively, and shops are dotted all along, displaying endlessly a succession of old ironwork signs with the mountain peaks in the background, picture taken many times by professionals and amateurs and we understand why. The atmosphere is friendly, even tough we greatly preferred Innsbruck. Zell Am See enjoys an exceptional location on the lakeshore with incredibly pure and clear water. Swimming there is very nice, but is not free as in Klagenfurt. The setting is idyllic and the place highly prized summer and winter alike. Mountains and fir trees reflect on the smooth surface of the lake where yachts sail serenely. However, the village itself has nothing extraordinary. Linz, capital of Upper Austria, is the third city in the country. Built originally by the Romans, it often had an important role in Austrian history. Crossed by the Danube, it is an industrial metropolis with labor calling, but also with cultural vocation. Developed and dynamic, it offers many artistic events. It greatly inspired Mozart during the time he lived there, since he composed the aptly named « Linz Symphony » in a house you can visit. Its castle, which history includes a few mysteries until the end of the 15th century, has been converted into a museum. Its superb centre abounds with Baroque and Renaissance buildings. The 20 meters high Holy Trinity column, dear to the Habsburg, overlooks the wide and beautiful Hauptpaltz. Its two cathedrals (Alter Dom and Neuer Dom), the St. Martin's Church and the old Town Hall are treasures of architecture. However, Linz likes to mix the old and the contemporary with a disconcerting ease, and magic works. The Ars Electronica Center, the Music Palace (Brucknerhaus) and the Lentos Kuntzmuseum in Linz on the bank of the Danube (lit at night in a succession of different colors) blends in with the decor without this contrast offending. On the contrary, it intrigues and it appeals to you, thus expressing an undeniable singularity which will not leave you indifferent. 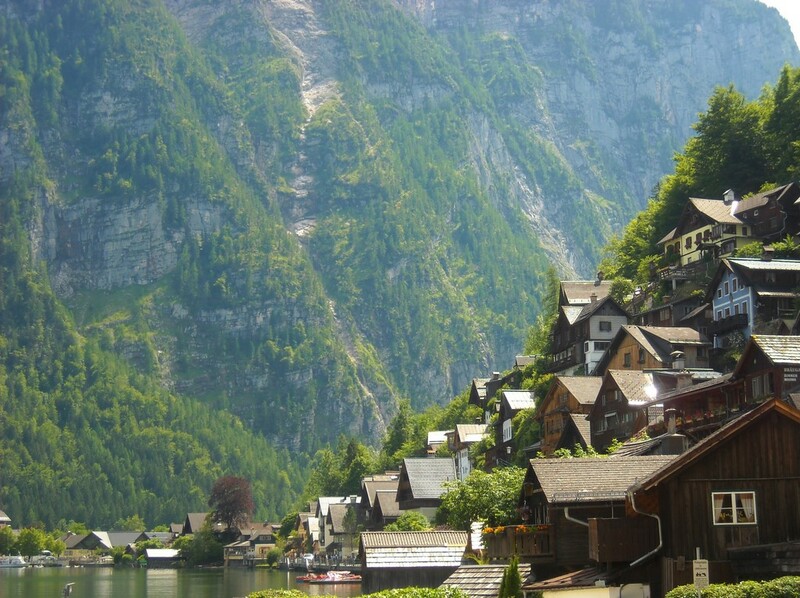 Hallstatt is a beautiful village on the lakeshore. Located on a mountainside in a setting with a breathtaking beauty, it is a UNESCO world heritage site. Taking a walk on the lakeshore and in the heart of the village leaves you with an unforgettable memory. Its church and its chapel, both Gothic style, its archaeological site and its museum are main attractions. You can complete the tour with a visit of the amazing caves of Dachstein, where nature shaped unusual concretions over centuries.